Clarke & Severn Electronics introduces Yantel’s new VAB and VAE Series rotary variable attenuators that operate in a wide frequency range of DC to 6000MHz. Available in two operating configurations, fixed step sizes and continuous steps, these connectorised units are available with BNC, N or SMA terminations. The fixed step type VAB series of rotary variable attenuators offers 0 to 30db over three models with step values of 1, 2 or 3 db. 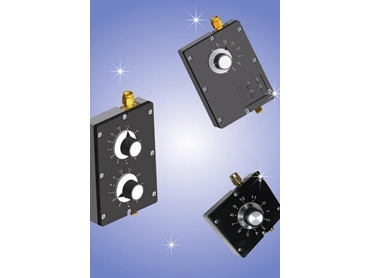 The continuous step type VAE series of rotary variable attenuators offers 0 to 15db or 0 to 30db ranges. Both models have a 3-watt power rating and operating temperature of -40ºC to +85ºC with an impedance of 50 or 75 ohms as well as low VSWR and low insertion loss. The excellent electrical characteristics of low insertion loss and VSWR over the operating temperature of -40ºC to +85ºC make the rotary variable attenuators ideally suited for broadcast, general RF applications and lab test benches.